Older answers are not working so I'm including things that may work in pieces. I used to be able to copy entire Chrome User Profile\Default from OS to OS and PC to PC. Chrome 44 Stable is more strict. I updated Chrome on both Win 8.1 instances (actual clones) to latest stable Chrome release. I did a copy + overwrite of Default "User profile" & it fails to work. The resolution/ answer lies in figuring out the structure of User Profile data (folders & files) & what parts of it should be left behind v/s which ones to be migrated. This error occurs due to changes in Chrome but weirdly, it does not occur on the source PC/OS. Chrome detected that some of your settings were corrupted by another program and reset them to their original defaults. 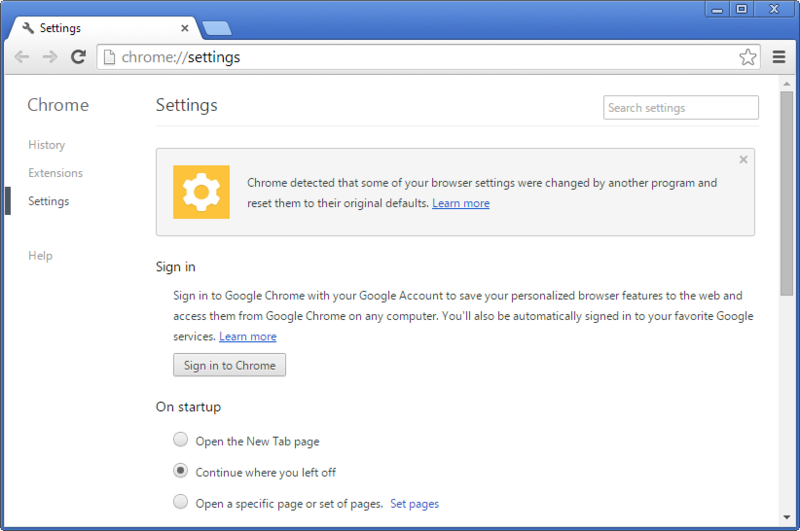 If Chrome resets your settings and you’re not signed in to Chrome, your settings will be reset to their defaults. If you’re signed in to Chrome, you’ll still see your customized settings. Sometimes programs will keep trying to change your settings. If this is the case, Chrome will continue to reset your browser settings every time it launches. You'll always be able to see your customized settings by signing into Chrome. Apparently, as per this thread here, recent versions of Chrome (but not Chromium) seem to be doing some extra 'unwarranted protection' and reset everything without asking the user. Is it possible to find out what part of settings (files, folders) are causing this error? Select parts of User Profile data that will migrate without error? https://superuser.com/a/473770/183467 - Re-Packaging as .crx: For a more compact version of your extensions (rather than the unpacked, folder version), you can use Chrome to re-package them into .crx files. I use this when I notice I still have an extension that is no longer available on the Chrome Web Store, and therefore will not sync back. How do I transfer my Google Chrome profile to a new PC? How can I copy Chrome settings without them getting reset? Some Outdated methods: I found some relevant methods, articles & answers which I have used before. I believe they are outdated now, given that Chrome has changed how it works with/ locks down User Profiles. I found a way to transfer without resetting. As you can guess, Chrome keeps around checksum/hash in the user profile. I found the file is User Data\Default\Secure Preferences. This is a plain-text JSON file, so we can take a look of it. In this file there are this protection and super_mac, which stores the HMAC_SHA256 of the other objects. If verification fails, the reset is triggered. This feature is implemented in Chromium, so if you are interested you can read their source code. Make sure you backup your old profile before anything. Make sure your User Data\Default\Extensions still has all extension directories. Make sure you also sync everything you need to Google account. Note, even you do this, many local extension preferences are not synced (extension not support). That's why we need next steps. Create a new profile. Then sync up with Google account. This will download every extension to the new profile. This step is to get you a good new Secure Preferences file. Close Chrome. Find the Secure Preferences file from the new profile. Use it to replace the one in your old profile. Remove the new profile and replace with your old profile. Now you should have almost everything restored. There is chance that some of your extensions (their preferences are still intact) are missing. This is because the extension directory path is versioned, and in step 3 Chrome created different path. You need to rename those from the old profile to the new one. Do not tamper the Secure Preferences. Good luck. I really hope Google change mind to allow user to transfer profile, since they can't guarantee that every extension will implement the preference sync. For time being, this method works on Chrome 49.0.2623.75. Google may change the verification method in the future. I have made several improvements upon Crend King's answer and found a method to transfer the user profile locally without the need to sync to a Google account and with no missing extensions. I used these steps to migrate the Chromium 59.0.3071.115 build from https://chromium.woolyss.com from Windows 7 to Windows 10. However, the differences between Chrome and Chromium described on this page indicates that while the path to the user data directory will be different, the contents thereof are compatible and can even be used to migrate directly from Chrome to Chromium. These steps will migrate the Default profile found at User Data/Default, but will also work for other profiles found at User Data/Profile 1, User Data/Profile 2, and so on. Backup your old profile and make sure your extensions are still under User Data/Default/Extensions. You will need to reinstall all your extensions from the Chrome web store and the contents of this directory will help you find which extensions you had if you no longer have access to your previous OS or you cannot remember all of them. Delete the existing Chromium/User Data directory and run Chromium to recreate it. Install all your extensions. The easiest way to do this is to look at the directories under User Data/Default/Extensions from your backup. For instance, if you had HTTPS Everywhere installed, there would be a directory User Data/Default/Extensions/gcbommkclmclpchllfjekcdonpmejbdp. Then the Chrome web store URL is https://chrome.google.com/webstore/detail/gcbommkclmclpchllfjekcdonpmejbdp. If you had Settings -> On startup -> Continue where you left off set previously, set it again. Close Chromium and delete everything under User Data/Default except Extensions and Secure Preferences. Then copy everything in from your backup under User Data/Default except Extensions and Secure Preferences. The reason for retaining Extensions is that, as noted by Crend King, the extension directories are versioned. I found that the contents of these directories are verified and if the extension has updated since the backup was made, then Chromium will consider the extension to be corrupt and your settings will be clobbered upon repair. Settings under chrome://extensions/ such as whether a particular extension is enabled or allowed in incognito. I believe this is a part of Secure Preferences. Profile name and icon which will default to Person 1 and the grey icon. This information as well as the list of available profiles is stored in Chromium/User Data/Local State and it does not seem hard to copy over the relevent parts. I know this is not a definite answer. I recently got my new Windows 8 PC. I copied the old default folder to the new PC and started Chrome but it said the profile was corrupted. After many attempts, I found out that I need to start Chrome first, let it create a blank profile. And then close Chrome, copy over the files and overwrite whatever files that is in the folder. After restarting Chrome, everything came back. There is a catch, though. My youtube playback will always stop randomly and the containing process would lose response. I tried everything I could think of. What I think fixed it is deleting all downloaded contents and cookies. I have no explanation for what the real reason is but this has been my experience. Not the answer you're looking for? Browse other questions tagged google-chrome google-chrome-extensions history user-profiles cookies or ask your own question. Google Сhrome new Secure Preferences, how mod preferences now? Is there a way to read chrome's “safe browsing” files?